What materials are used when building ? compounds (fur, for example) can cause allergies, and they are less plastic. This material is for building with a matte shade. In addition, the “mink” cilia are thicker than usual and have piercingly black color. It is not recommended to increase the “mink” on thin and weak native hairs. “Silk” is used in the classic building. It is thin, soft, light, the most natural. But very whimsical in care. Silk eyelashes are afraid of high temperatures (bath, sauna), as well as water. The less you wet them, the longer they will last. A blend of full volume and classic, using a triple-seal technique that makes the extensions last longer and provides your lashes with a fuller appearance. Hybrid lash extensions are one of the most popular service due to the density and the long-lasting effect of the extensions. 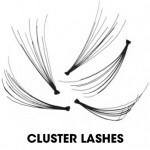 These lashes are thick and heavy clusters of pre made lashes bouquets applied to your natural lashes. The problem with these lashes are that they are very thick and heavy, most of the time using a lot of glue. With lashes like these your natural lashes can’t fallout or cycle like they should. They will usually break due to the weight and glue of the clusters, they hurt a lot and they look a lot like fake lashes. All of these things could lead to eye mites, eye infections. But definitely to unhealthy weak and short lashes. This is cluster lashes. As you can see, there is a lot of glue making the eyelash heavy and the lashes stick together like a fan. The quality of the glue depends almost all the success of the event to build. For your safety, the adhesive must be purchased in a special shop, and have a lot of positive feedback. Different glue and in work manifests itself unequally. Some species almost instantly seize, others – need a bit to withstand. 3. Additional materials and tools – patches (patches), degreasers, fixers, tweezers, cotton swabs and more. WHAT EYELASH EXTENSION STYLE SHOULD I CHOOSE? 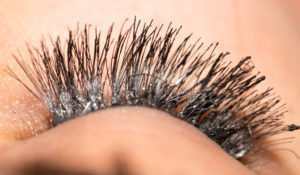 There are a bunch of different eyelash extension styles to choose at different salons, ranging from classic extensions to full glamour volume sets. The studio I visited even offers a wide rage of lashes, which is the latest extreme trend, the ultimate volume for your eyelids. I came in 20 minutes early, since I had nothing much to do. I was greeted by the front desk, who offered me water and a free massage chair massage. First, the lash tech places a pad under both my eyes to keep my bottom lashes out of the way. Then, using tweezers she started applying false lashes one-by-one on my eyelash. The treatment was so relaxing and the music in the background made me relieve all my stress away. I even took a short nap. The process didn’t even hurt and it only felt like someone was ticking my eyelash. When I opened my eyelash I couldn’t believe it was only one and a half hours, I even took the best nap. The lash tech brought me a mirror and I couldn’t believe my reflection. The eyelash extensions looked even more glamorous then I thought it would be. Now I really wished I would have gotten them sooner because man I have been getting A LOT of compliments lately. Every time I am talking to someone they always stop me in the middle of my sentence to compliment me. Wow! I am so happy that I found Blossom Beauty Studio for doing such a great job with my eyelash extensions. I feel so confident in my look now. So far it’s been the third week and it is starting to fall out. Can’t wait to go back for a refill. But for now, I will enjoy my luscious lash experience.